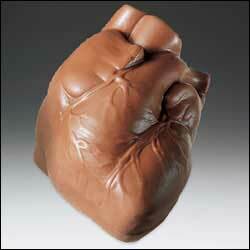 Bite into our solid, milk chocolate, anatomically correct human heart. It's one pound of solid chocolate and is made from premium chocolate, they make the ultimate gift for doctors, anatomy students or your sweetheart. We purchase our chocolate direct from the manufacturer. We want to provide you with the freshest chocolate available. We ship our chocolate from our TEXAS warehouse. Our heart comes in a gift box,and we will be happy to include a gift card of 25 words or less. Note: Chocolate is NOT shipped during HOT Months of May-Sept. Chocolate is available from OCT-APRIL ONLY. Shipped only within the U.S. Please place your order for Valentine's Day chocolate no later than February 4th. Weather this time of year tends to slow shipping down, so please shop early! Please contact us for quantity discounts on any of our chocolates. Case discounts can save you money! For Gift Note or Gift Card please use the Contact button on our website. Please select Customer Service email option and enter your card information. It really helps us if you include the Order Number.